Controlling is a flash game made using the Flixel in less than 48 hours for the Ludum Dare Game Jam 23 by me (Dan Lin). The art was done in Gimp and the sounds and music was done in OpenMPT Tracker. 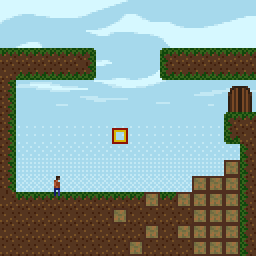 You play as a guy in this puzzle platformer. The main mechanics involve the absence of jumping, wrapping around of the stage, and being able to move around blocks and placing them using the mouse. The player progresses through the levels. Hey guys, Dan here. Controlling is the game I made for Ludum Dare’s 23rd 48 hour game jam. The theme was Tiny World. Some explanation of the game can be found on the Ludum Dare site. Check it out here, on the Ludum Dare website, Kongregate, or Newgrounds!